The most recent edition of the Surrey Archaeological Society Bulletin (I’m writing this in mid-February 2013, half-watching a sodden and bruising Six Nations match between Ireland and England) includes on page 14 a note by Alan Bott, author of the lavish combined guide to the parish churches of Witley and Thursley, responding to the section of the published version of ‘Thursley revisited’ concerning the date of the earliest standing phase of Thursley church. My favouring of a date for its construction post-dating not only the Battle of Hastings but the Domesday Survey as well is subject to a series of observations and criticisms that I will respond to in the paragraphs below. I have elected to do this here rather than by means of a further Bulletin piece as it provides more space in which to consider the various questions in hand and to expand upon some in a means that was not possible and/or practicable in the original article. Plus, there’s nothing more tedious than a debate between two people being conducted in print that goes over the same ground in ever finer detail. I hope the following is read in the spirit in which it was written, one of carefully-considered, constructive debate rather than pedantic, personal nit-picking. I expect it will not prompt a wholesale change in currently-held opinions, and I concur with Mr Bott when he says the best bet for resolving the thorny question of the date of the two buildings is to hope that advances are made in dendrochronological (or radiocarbon) sampling that will allow accurate dates to be obtained without doing undue damage to the structures in question. Let’s begin with an explanation of my purported failure to cite the 1990 Alecto County Edition of Surrey’s Domesday Book entries, with its introduction by John Blair. The simple fact of the matter is that I have never seen a copy of it in a library nor have I ever had a spare £150+ to splash out on one of the few second-hand copies available via Amazon. I don’t doubt for a second that it is and shall remain for decades to come the definitive edition of the relevant folios. What I do question is the prioritisation of one essay as “the master-work” over others by the same author, particularly ones of more thematic relevance to the question of local church foundation and architectural dating. Mr Bott quotes a footnote from Blair’s introduction stating that examples of missing Domesday churches “probably include Wotton, Thursley and Godstone”. This grouping needs to be broken down and the credentials of each church be assessed on its own merits. Wotton happens to be one of the two Surrey churches I looked at in depth for my Master’s thesis (note to self – it’s high time I gave it a polish and uploaded it for wider consumption). The phasing of its earliest fabric had never been satisfactorily explained, although Blair got close in Early Medieval Surrey (Blair 1991, 113, 201 note 30). I developed his postulation to suggest that a small two-celled church, represented by the present nave (and a narrow round-headed chancel arch until the mid-ninteenth century), was greatly enlarged in the final years of the eleventh century by the construction of a new nave and central tower, the latter immuring the west wall of the original nave, which became the chancel. There are no extant architectural details belonging to the earliest surviving phase capable of dating, nor any specific records of lost features to interpret thus, but a late Anglo-Saxon date seems most credible. Godstone, by contrast, is cited on the strength of the reference to a minster at Walkingstead, i.e. Godstone, in the will of Brihtric and Ælfswith, dated to the years 975 x 987 (“ða tyn hyda on Strættune . into þæm mynstre . to Wolcnesstede“- S 1511). The reasons for Thursley being named alongside these two should be obvious to anyone who has read my article and what Mr Bott has written about its early fabric, but this does not mean they are compelling. Whatever the evidence, and wherever it is presented, acceptance can only come from it being subjected to critical analysis and not being found to be wanting. …concerning whom there needs to be some clarification. Mr Bott reasserts his earlier suggested ascription of the patronage of the two church buildings to Earl Godwin(e). This has important implications, for the Earl died in 1053, which would make the two church buildings under discussion around 50 years earlier than the date I would favour for their construction. Mr Bott has previously drawn parallels between the styles of Witley/Thursley and the so-called Odda’s Chapel at Deerhurst in Gloucestershire (e.g. Bott 2003, 84), which is associated with a date-stone bearing a regnal date equivalent to 12th April 1056. Such fine dating of generic architectural features, even when seemingly corroborated by textual evidence, ignores the incontrovertible persistence of many within the architectural lexicon of the “Overlap” period and beyond. Godwine’s West Saxon earldom – and presumably the Witley estate if it was in the family’s possession at the time – was inherited by his son Harold, who is conspicuous by his misrepresentation in Domesday Book as a consequence of lingering political prejudice. It is worth making the point that Harold could have been the man behind the building of both structures. Godwine is believed to have attained the rank of earl over eastern Wessex by 1018, meaning a maximum possible window for his commissioning of the ecclesiastical buildings at Witley and Thursley in excess of 35 years. Harold, on the other hand, had no more than 13 years to do the same. Though this proves nothing in itself – and by no means should be taken as a sign that I subscribe to the idea of a pre-Norman date for either edifice – it is important that the facts are presented correctly. I regret being unaware of Blair’s chapter ‘Parish Churches in the Eleventh Century’ in The Story of Domesday Book (first published in 1987 as Domesday Book Studies) at the time I completed the published version of ‘Thursley revisited’, as the brief mention it makes of Thursley would have tempered the substantial divergence between Blair’s implicit proposal of an early twelfth-century date of construction for both churches (deriving from Blair 1991, 115 – it is worth noting here that Gilbert de l’Aigle died in 1118) and Mr Bott’s mid-eleventh-century dating. I find it interesting that my word “untenable” should have been redeployed to describe the two buildings having “both Anglo-Saxon and Norman features”, which I take to refer to their relative dates as well as styles. In fairness, the actual context of my use of it – to refer to the date of the font at Thursley – is somewhat ambiguous. However, it links in with an essay on early fonts by – who else? – John Blair published in 2010. This wide-ranging work includes a valuable reinterpretation of the ninth-century sculptural fragments at Godalming church as pieces of a stone stand for a font bowl (Blair 2010, 167-68). More important in terms of the date of Thursley’s font – here’s a good picture of it from a series of shots of Thursley church by golygfa I found on Flickr – is his perception of a number of “critical changes” from circa 1050 that saw the proliferation of more “monumental” font designs. Especially pertinent is his observation that the greater size and monolithic nature of many fonts made their transportation very hard, suggesting they became fixed rather than mobile liturgical instruments (2010, 175, 177). 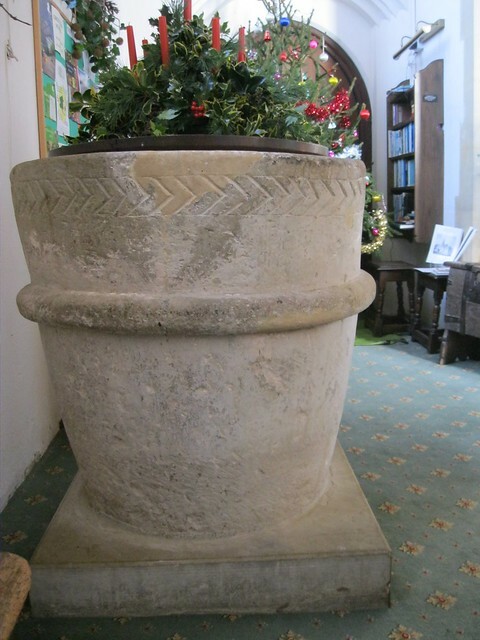 These observations are not a lot of help when it comes to dating the font at Thursley with real precision but they strongly recommend that it was fashioned and first installed in a local ecclesiastical building (be it Thursley, Witley or somewhere else) after the death of Earl Godwine. One final point – and a chance to fly a kite. An idea I chose not mention in any version of ‘Thursley revisited’ is that Witley’s recorded Domesday church was located neither at Witley nor Thursley but at another location within the twenty-hide estate. My hypothesis in this regard is that the church stood at Oxenford, where a local legend about the former existence of a nunnery – an interesting detail – was first recorded by John Aubrey (The Natural History of the County of Surrey, Volume 4, page 39). Understandably, the notion has been questioned but I have an inkling that there might be more validity to it than meets the eye. There is a reference in some medieval royal rolls (I forget which) of the King (ditto) witnessing a transaction at “the monastery of Witley”, which was correlated with what Aubrey wrote by the inimitable David Knowles in his Medieval Religious Houses: England and Wales (I don’t have details of the reference to hand). However, the medieval reference may not be all it seems; I have a sneaking suspicion that the translator of the rolls used by Knowles may have mistaken the abbreviated word describing the place where the deed was witnessed for one denoting a monastery (most likely coenobium) rather than a similar-looking word with a significantly different meaning. Unfortunately, at present there is nothing else concrete to support the conjecture. All that can be done is to outline what might have happened between the foundation of the monastery (presumably in the mid-Anglo-Saxon period – there seems scant likelihood that a late Anglo-Saxon nunnery could have existed and escaped any form of record, Aubrey’s hearsay aside) and the time of the Domesday Survey. It is clear from Domesday Book that most minsters in Surrey were well on the way to being “normal” parish churches by the 1080s (to the extent that Blair’s survey of them in Early Medieval Surrey probably misses a few altogether). On a similar note, a number of fieldwork projects have demonstrated how well-established church sites continued in use even after population shifted to places well removed from them; the “Old Church” at Shapwick in Somerset is one prominent example (although I have just remembered the idea of it being a former minster was queried by Nick Corcos in this 2001 article in the journal Assemblage). It may have been that a church persisted on the old Oxenford nunnery site in 1086 but, standing at the very northern tip of the estate, it was distant from the estate centre and the bulk of its population. As a result its days were numbered and so the decision was taken not long after to build a more conveniently-sited church at Witley and a daughter foundation at Thursley (whose theophoric place-name is surely the best explanation for why a chapel was erected there). Subsequent – and entirely separate – to this ecclesiastical re-jig, Oxenford was granted to Waverley Abbey by Richere de l’Aigle, Gilbert’s son and heir. Might Oxenford’s former ecclesiastical identity have had a bearing on this gift? Only a great deal more documentary and archaeological digging will provide the answer to this and some of the other questions raised above.